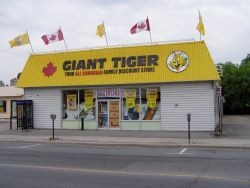 It was during the writing of the page on The Northern Store that I realized that Giant Tiger deserves a quick write-up too, especially for those who don’t know what Giant Tiger is. Giant Tiger is a Canadian-owned discount store that operates in smaller market areas and is found throughout northeastern Ontario. I pretty much lived out of Giant Tiger whilst I lived in northern Ontario. I would have lived in the basement if I could – much more efficient since I was there every day anyway. It has name brands and no name brands (albeit more of the latter.) It is known for having deals on discount items that can come in handy now and then. A lot of the time you just need normal stuff – I don’t want Birkenstocks on my feet when I go out in the garden, I just want some sort of sandal thing that can get dirty and keep me from going barefoot. Why pay $100 at a shoe store or $50 at discount place when I can get a pair sandals for $9.95 at Giant Tiger?!? It offers a wide selection of stuff including clothing, housewares, business supplies, toiletries, frozen foods, tinned foods, and much more. (I essentially bought all of my food here when I was living out of my old place of work up North.) Really, it picks up where Bi-Way left off when it went exited the Canadian market. I grew up on Bi-Way, so Giant Tiger is a welcome addition for cheapo stuff or stuff that’s not worth buying expensively. The last Giant Tiger on Highway 11 is in Cochrane. Giant Tiger has an agreement with the owners of The Northern Store to operate Giant Tigers in the prairies.